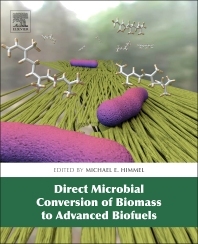 'Direct Microbial Conversion of Biomass to Advanced Biofuels' is a stylized text that is rich in both the basic and applied sciences. It provides a higher level summary of the most important aspects of the topic, addressing critical problems solved by deep science. Expert users will find new, critical methods that can be applied to their work, detailed experimental plans, important outcomes given for illustrative problems, and conclusions drawn for specific studies that address broad based issues. A broad range of readers will find this to be a comprehensive, informational text on the subject matter, including experimentalists and even CEOs deciding on new business directions. This book will appeal not only to biochemists, molecular biologists, chemists, and microbiologists working to understand the fundamental problems associated with biomass conversion research, but also chemical and mechanical engineers working to design new conversion processes for advanced biofuels. A secondary market will be DOE and other government staff looking for expert advice in the field of Biofuels production.